^ Brown, Mark (December 27, 2013). "Britain's black power movement is at risk of being forgotten, say historians". The Guardian. Retrieved January 2, 2017. 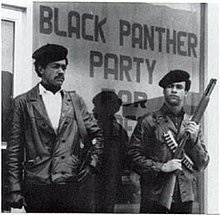 ^ a b "October 15, 1966: The Black Panther Party Is Founded". The Nation. ISSN 0027-8378. Retrieved December 15, 2015. ^ "Hoover Calls Panthers Top Threat to Security". The Washington Post. WP Company LLC d/b/a The Washington Post. July 16, 1969. Retrieved February 9, 2017. ^ "Panthers 'threaten' U.S., Hoover says". Afro-American. Afro - American Company of Baltimore City. July 26, 1969. Retrieved February 9, 2017. ^ "Interview With Eldridge Cleaver; The Two Nations Of Black America". PBS. Retrieved March 30, 2014. ^ Editor, Lilly Workneh Black Voices Senior; Editor, The Huffington Post Taryn Finley Black Voices Associate; Post, The Huffington (February 18, 2016). "27 Important Facts Everyone Should Know About The Black Panthers". The Huffington Post. Retrieved February 7, 2017. ^ Warren, Jenifer (May 2, 1998). 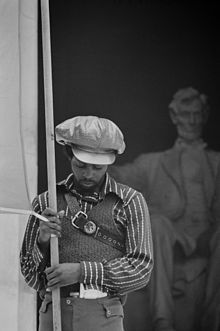 "Former Black Panther Eldridge Cleaver Dies at 62". latimes. Retrieved September 12, 2015. ^ Young, Benjamin (February 6, 2013). "North Korea and the American Radical Left". NKIDP e-Dossier no. 14. Woodrow Wilson Center. Retrieved March 5, 2014. ^ McClendon III, John H. (1996). "Elaine Brown". In Smith, Jessie Carney (ed.). Notable Black American Women, Book 2. VNR AG. pp. 66–67. ^ Keating, Fiona (October 24, 2015). "Women of the revolution: More than 50% of the Black Panther Party were women and carried guns". International Business Times. ^ Cleaver, Kathleen Neal (June 1, 1999). "Women, power, and revolution". New Political Science. 21 (2): 231–236. doi:10.1080/07393149908429865. ISSN 0739-3148. 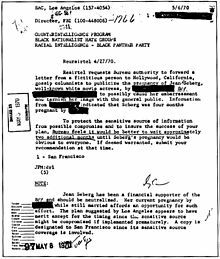 ^ "Whose Revolution is This - Gender's Divisive Role in the Black Panther Party Ninth Symposium Issue of Gender and Sexuality Law: Note 9 Georgetown Journal of Gender and the Law 2008". heinonline.org. Retrieved October 6, 2016. ^ "Say It Loud: 9 Black Women in the Black Power Movement Everyone Should Know". For Harriet | Celebrating the Fullness of Black Womanhood. Retrieved October 6, 2016. ^ Bauer, Kari (February 22, 2016). "No Revolution Without Us: Feminists of the Black Panther Party, with Lynn C. French and Salamishah Tillet". Urban Democracy Lab. Retrieved June 25, 2016. ^ a b Brown, DeNeen L. (January 10, 2018). "'I have all the guns and money': When a woman led the Black Panther Party". Washington Post. ISSN 0190-8286. Retrieved February 18, 2018. ^ "We're Assata's Daughters". Zed Collective. October 19, 2016. Retrieved March 14, 2017. Bloom, Joshua; Martin, Waldo E. Jr. (2013). Black against Empire: The History and Politics of the Black Panther Party. University of California Press. p. 315. ISBN 9780520953543. Retrieved December 16, 2015. "The Black Panthers: Vanguard of the Revolution | Documentary about Black Panther Party | Independent Lens | PBS". Independent Lens. Retrieved October 6, 2016. This page was last edited on 18 April 2019, at 13:32 (UTC).